13th January, 2012. The Costa Concordia hits a rock near Isola del Giglio, which makes a long gash in the ship’s side. The ship starts to capsize and slowly drift back to the shore. Half of the ship remained above water. The tragedy claimed up to 32 lives. This disaster was a big event for the Tuscan Island of Giglio. Tourists lined up in nearby Santo Stefano to purchase tickets to see the sinking ship. Isola del Giglio had become ‘a sort of museum’, according to the mayor. And this is how tour operators managed to turn a disaster into a commercial success for them. This holiday received a lot of contradictory reactions, and the link was made with a similar disaster, 100 years ago: the Titanic. The fine line between altruism/empathy (if this word can even be used for ‘disaster tourism’ like this) and voyeurism isn’t questioned when a cruise ship plans the exact route the Titanic did. And the tour operator isn’t shy to charge you around 2000 pounds for it. When somebody says shipwreck, you obviously think about the Titanic. The Top-Of-Mind of this ship is so strong that it has become a brand on its own. Which is visible in the number of gadgets that are made! Games were developed about the Titanic story, a lot of exhibitions and museums concerning the subject are still popular, and the movie ‘Titanic’ with Dicaprio and Winslet romanticized this calamity so much that people forgot what a massive tragedy this was. 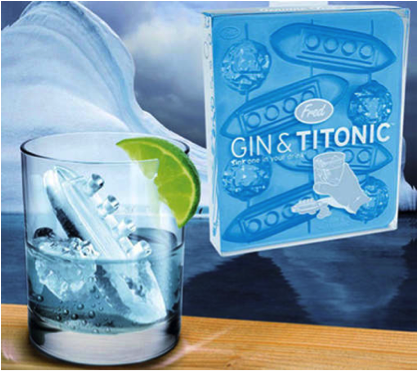 Even children can play in an inflatable version of a sinking Titanic, and the most interesting gadget was the Gin Titonic. You can customize your cocktail by adding ice and a small Titanic Ship to your glass. Well, whatever floats your boat! But how much time does it take to make a disaster historically interesting instead of a macabre tourist site? What is the difference between Costa Concordia and Roman battle sites? When is it ok to commercialize disasters? If you thought that crisis periods were a bad time for business, think again. Travel agencies like Disaster tourism offer you ‘a complete disaster’. Not only travel agencies play on calamities: October 29, hurricane Sandy reached the east coast of the United States. The hurricane affected 24 states and in only 2 days, 67 victims were made. It was branded as ‘the Frankenstorm’ because of its possible meteorological impact. CNN tried to ban the name because they said it trivializes the impact of the storm. After the storm died out, several retailers used this disaster as an opportunity to promote. Jonathan Adler for example, urged shoppers to ‘storm’ their site, and by entering code ‘Sandy’ at checkout, free shipping was offered. 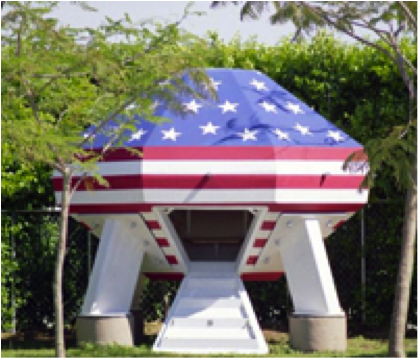 After an apology, the company did change the code into ‘Stuckinside’ or ‘Freeship1012’. American Apparel tried to get those ‘bored during the storm’ to do more online shopping, but didn’t get good reactions on the promotion. A third retailer with a dark sense of humour was Urban Outfitters, ‘This storm blows’ with code ‘allsoggy’ had to stimulate people to buy more. It didn’t matter how good the intentions of the company were, their timing wasn’t off and the use of puns didn’t work in their advantage either. Duracell, the most Rapid Responder! On the other hand, some public relations representatives used, what they call ‘newsjacking’. They tried to inject their brand’s ideas into the news and generate content for the brand through a breaking news story. E-mails, Twitter messages… were sent to reporters, while Sandy raged. Other companies waited until after the storm to make a contribution: the Coca-Cola Company for example e-mailed reporters about how its philanthropic arm had pledged 1 million dollars to ‘community relief efforts’. 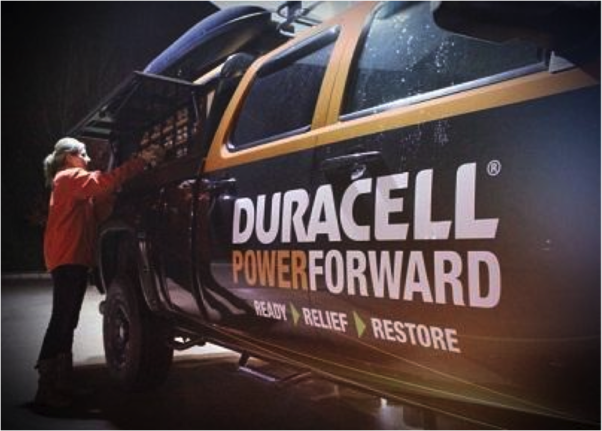 Procter&Gamble even dispatched a truck called ‘the Duracell Rapid Responder’, which offered free batteries and access to charging lockers for mobile devices and computers. The Facebook page showed all locations of the vehicles. The reactions to their efforts were exclusively positive! A brand is all about its customers. Therefore communication should be maintained with them during a period of crisis. Saks Fifth Avenue in New York sent all customers a message that Saks stores would stay open, helping everyone in need. It’s not surprising that big consumer brands are the first ones to help out during crisis: these brands have muscle. They have the power to educate people and their national reach ensures the message will be heard. Verizon, for example, used its Facebook page to prepare followers for the storm by offering an ‘emergency preparedness guide’. These examples show that brands can be Triple A, even in a crisis period. They activate people to use their product, are authentic in what they do and they remain accountable. Our society depends on goods and services, and brands these days should put everything in motion for customers during crisis, and do their part to help. They have the power; why not use it in times of crisis?